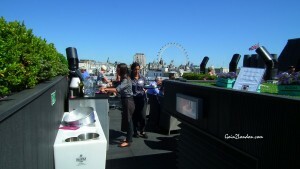 My wife and I paid a visit to central London’s largest rooftop bar last Friday, we were not disappointed. Thanks to Groupon (once again) we managed to sample another top venue for a reasonable price. The Groupon* deal cost £29.50 (for 2) and comprised a Frozen Cocktail each and a Spanish sharing platter. On arrival at the Trafalgar Hotel we presented our Groupon Voucher to reception. The friendly receptionist then pointed us to the waiting lift, ready to whisk us up to the 6th floor. 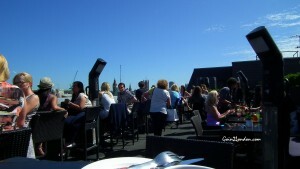 After scaling several steps up to the roof bar we were met by a waitress who readied our table. 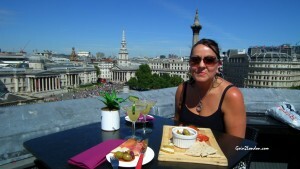 We couldn’t have chosen better ourselves, a table for two on the high stools overlooking Trafalgar Square. We were both happy to accept their selected Cocktail, Margarita. They promptly arrived and tasted as good as they looked. We had 10 minutes or so to take in the excellent views over Trafalgar Square (and beyond) before our Spanish sharing platter was delivered. The size of the platter was not over generous, but what we did have we thoroughly enjoyed. It consisted of two meats, one cheese, bread and a bowl of superb tasting mixed olives. The dress code was casual and the atmosphere very relaxed as everyone enjoyed their elevated location with a view. Best views were had by couples sitting around the periphery of the bar, whilst larger groups were generally more centrally positioned. The Vista Bar at The Trafalgar Hotel is a great place to spend time on a lovely summers day (bring a hat if you need cover) and gets the thumbs up from Going2London. * The Groupon deal we enjoyed is no longer available but keep an eye out for similar deals.